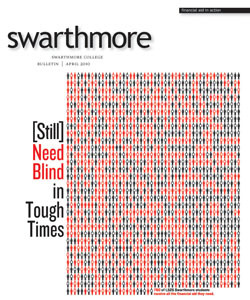 As economics majors, we write in response to your recent article on the economist and Swarthmore graduate Dean Baker ’80 (“Bubblebuster,” January 2010). Although we have more than one quibble with the article, we seek to clarify one particular point of fact. The article asserts that during Baker’s time at Swarthmore, the economics department was “dominated by conservatives.” We cannot be sure exactly what is meant by this statement or how Paul Wachter ’97, the author, came to view it as accurate. Nonetheless, we have previously run across similar statements and would like to offer our perspective. We began our studies at Swarthmore soon after Baker graduated and probably remember many of the same economics professors. To the best of our knowledge, the great majority were liberal to moderate. We had many disagreements about what we were being taught at Swarthmore, but we both recall signs of a vigorous “left” in the department. For example, combining some of our recollections, we recall a microeconomics professor who encouraged one of us to write seminar papers about heterodox economics; two professors who argued in support of Keynesian macroeconomics in honors theory seminars; David Weiman, the deeply skeptical scholar of the history of economic thought and American economic history, who was mentioned in the article; unorthodox visiting speakers such as Kenneth Boulding, Alfred Eichner, Herb Gintis, David Gordon, Steve Marglin, Juliet Schor, and Sidney Weintraub; and a professor who had fought for more interventionist economic development policies in an earlier job as an economist at the World Bank. Like almost all mainstream economists in the United States, most of our professors shared the belief that competitive markets were a desirable goal in most cases, but few if any argued for the libertarian approach of Milton Friedman and his Chicago School. Market failures were discussed frequently, and professors often argued in favor of regulation and governmental efforts to redistribute income and wealth—in the vein of Paul Samuelson and the majority of East-Coast establishment economists of the era. On the other hand, few challenged the fundamental assumptions of American capitalism, empiricist social science, and a patriarchal social order in the way they were being challenged at the time by many professors in other departments. These remembrances might reasonably strike a reader of this magazine as indications of a modernist, technocratic politics that was out of step with much of the College’s curriculum, but with memories short, we wish to discourage the unfortunate and mistaken impression that our professors were teaching us the Republican dogma of that time or of the present. Moreover, in spite of the many heated controversies of the Reagan era, the department’s bread and butter was the modeling and econometrics typical of U.S. economics programs, not freewheeling political debate.